POWER DUO. Sarah Harless, left, and Emily Long will be the first two women to serve as Eau Claire County judges at the same time. They were both elected April 3 and will be sworn in this summer. 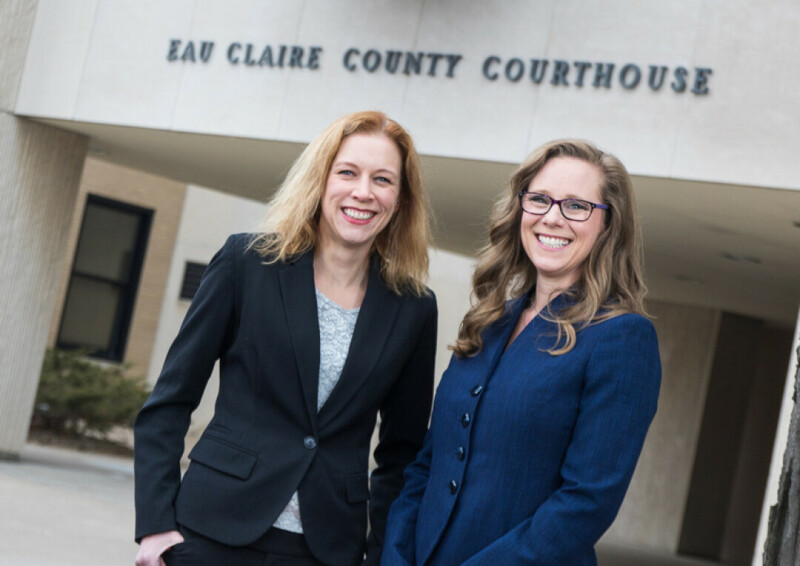 On April 3, two female attorneys – Emily Long and Sarah Harless – were elected by Eau Claire County residents to serve as the next Branch 3 and Branch 5 judges. It was a significant historical event: For the first time in the county’s history, two of the five serving judges will be female. While two other women – Judges Lisa Stark and Kristina Bourget – previously served, there have never been two female judges on the bench at the same time. Both Harless and Long will be sworn in over the summer. We talked to them about what they bring to the courtroom, who they look up to, and what it’s like to be role models for the next generation. Haley Wright: How do you think your experience as a wife and mom (and female attorney) will impact your perspective and approach to being a judge? Harless: I think all judges are impacted by their life experiences. As a woman, my set of life experiences has obviously been impacted by my gender. Throughout my life I have seen what can happen when a person defies gender norms and expectations. As a child I remember being teased by male students and advised to just ignore it. When I fought back I was sent to the principal’s office. In law school I remember being excited after a particularly successful semester ­– just to have a male student say that the professors were going easy on the female students (despite the fact that all exams were blind graded). I remember my first deposition as a new attorney, walking in to the firm with my stack of case files and notes, only to be introduced as the court reporter. Motherhood has brought an entirely new perspective. I still remember the first time I said “Because I said so!” to my kid, something that frustrated me to no end as a child and something I swore I would never say as a mother. But every parent learns pretty quickly that you really don’t have any idea what parenting is like until you are there in the trenches. My combined experience as a woman and a mother has shown me the importance of not making snap judgments, and the importance of not thinking that you fully understand something that you have not experienced. Do you think female judges have a unique perspective or something additional to bring to serving on the bench? Harless: Absolutely! Every judge brings with them their own unique perspective. Women have a different set of life experiences than men, and bring that background and knowledge with them. Our judiciary is strengthened by having a variety of voices contributing to the conversation. Do you have a female judge or mentor you look up to? Long: Absolutely. The Honorable Lisa K. Stark changed the face of the Eau Claire County judiciary by being elected the county’s first female judge in 2000. Her competence as a circuit court judge not only earned her respect throughout Eau Claire County, but also throughout the state, which led to her election to the Wisconsin Court of Appeals. Judge Stark brought treatment courts to Eau Claire County by creating the Eau Claire County Drug Court, which has become a national model. Aside from leading by example, Judge Stark has personally given me guidance and support I can never repay. What impact do you believe having two female judges sworn in and serving at the same time will have on the community as a whole (and on impressionable kids who may aspire to this occupation)? Long: Before I went to law school, I substitute taught. One of the young female students asked me if I was going to be a teacher. I told her I was actually going to law school. She looked puzzled and told me she did not know “girls could be lawyers.” She then declared she was going to be a lawyer. I think it is positive for children to see positive role models of all kinds. What impact do you believe having two female judges sworn in and serving at the same time will have on the legal community? Harless: I hope that this will help to normalize the idea that men and women can serve a variety of roles in the legal community regardless of gender, from attorney, to court reporter, to judge. What advice would you give to girls or women who endeavor to serve in the legal profession? Harless: Follow your heart. It may take a thick skin and it will take a lot of hard work, but the law is a great, noble profession and well worth the effort.